A short summary of the filled-pause saga so far: If we call nasal-final filled pauses UM and non-nasal varieties UH, younger people use UM more than older people, and women use UM more than men. We've found this to be true in several varieties of English (sampled all over the U.S., sampled all over the U.K., from Philadelphia, from Glasgow) and in several other Germanic languages (Dutch and German). In addition, in the Philadelphia Neighborhood Corpus, where we have interviews gathered over four decades of real time as well as interviews with speakers of different ages, it appears that there is a historical trend as well as a life-cycle phenomenon. Contributions to this work-in-progress have come from Mark Liberman (University of Pennsylvania), Martijn Wieling (University of Groningen), Josef Fruehwald (University of Edinburgh), and John Coleman (University of Oxford), among others. Below is a guest post by Martijn Wieling, adding one more Germanic language to the list. After conducting the analysis about the uh/um distinction and its relation to gender and age for Dutch and German speakers, I tried to obtain corpora for additional languages as well. In the present post, I’m focusing on the Norwegian data obtained from the Nordic Dialect Corpus and Syntax Database. 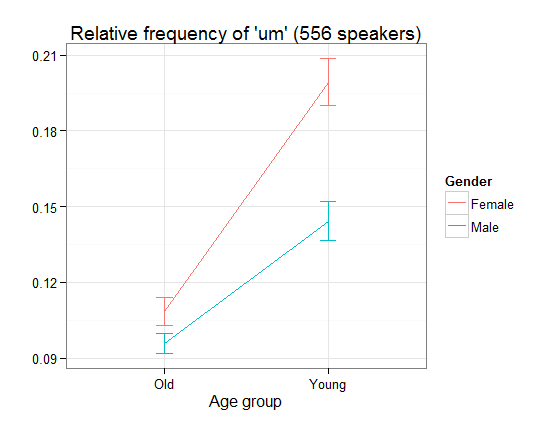 Given that hesitation markers were marked in the Norwegian data, and speaker characteristics including age group (young: mainly between 15 and 30, old: 50+) and gender were present as well, the corpus is excellently suited for an uh/um investigation™. In this database (and, I suppose, in Norwegian writing in general), there are some hesitation markers with ‘m’ (generally transcribed as ‘em’ or ‘m’) and some without (generally transcribed as ‘e’). To allow for an easy comparison to the results from the other languages, I’ll refer to these forms as ‘um’ and ‘uh’, respectively. Besides the information about age and gender, the corpus also contains the year of recording. Given that the recording period is quite extensive, starting from 1951 and ending in 2012, this is an interesting variable to investigate. In a new logistic mixed-effects regression model, also including gender and age group (which is always registered with respect to the year of recording; a young person recorded in 1960 would be an old person when being recorded in 2010), year of recording showed a significant (p < 0.0001) positive effect on the relative frequency of ‘um’ versus ‘uh’: more recent recordings show an increased frequency of ‘um’ use. Note that the effects of age group and gender remained significant and in the same direction as in the model without year of recording. In sum, this may suggest that – besides the hypotheses put forward earlier about the possible different functions of ‘um’ and ‘uh’ – ‘um’ may simply denote a more modern hesitation marker. All results of the analysis can be viewed and replicated here: http://www.let.rug.nl/wieling/ll/analysis-Norwegian.html. Above is a guest post by Martijn Wieling.